Hull FC coach Lee Radford believes the new rule changes being introduced in Super League will benefit his team in 2019. Radford, whose team ended 2018 with 11 successive defeats, has welcomed the arrival of the shot clock and the reduction in the number of interchanges, believing a faster game will suit his side. I wasn’t a fan but when we played under two refs in Australia against St George, all of the players said it really cleaned the ruck up so I went from being a hater to a lover. “I’m definitely on board with them,” Radford said at the club’s pre-season media day at the KCOM Stadium. “I was a little bit disappointed they didn’t go full tilt and have the two refs as well. “I wasn’t a fan but when we played under two refs in Australia against St George, all of the players said it really cleaned the ruck up so I went from being a hater to a lover. “For us, a quicker game suits us. It might not suit some teams but when we play quick, when our game speeds are high, we tend to get a result. We’ve practised all pre-season around that. Hull’s close-season recruitment has been modest in comparison to the majority of their Super League rivals but Radford is hoping the return of a host of senior players from injury can provide a tonic. “In the eights last year we had £700,000 worth of our salary cap sat in the stand,” he said. “That meant some of our young fellas were playing week in, week out and it didn’t matter if they were playing terrible, they were playing the week after. Hull will have half-backs Albert Kelly and Marc Sneyd fit for the opening game against Hull KR on February 1 but at least four players will sit out at least the first month. Prop Chris Green is facing a lengthy spell on the sidelines with a ruptured Achilles, while fellow front rower Josh Bowden, wiinger Fetuli Talanoa and loose forward Joe Westerman will also miss the start as they continue their recovery from knee injuries. Radford says the club have placed a big emphasis on conditioning during a tough pre-season so far after conceding his players went into the 2018 season under-prepared, partly due to the World Cup. 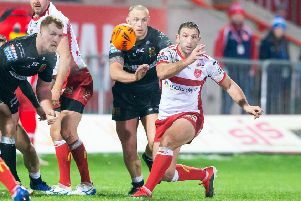 “You have to have a certain amount of durability to get you through the season and that’s what pre-season is there for, to put you in a physical spot where you can cope with the weekly demands of Super League,” Radford said.